The original plan for yesterday was to go to Dinosaur Valley State Park, but we ended up at Meridian State Park instead. I picked up a book on Texas Hikes from the library, and Meridian was in there. 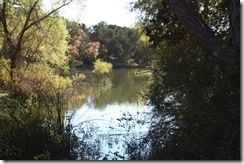 Meridian State Park is just a bit north of Waco, Texas. It was a gorgeous fall day today, the weather just a bit on the chilly side. The drive took us past many changing trees, along with the usual cattle, goats and even a zebra. I had a bit of a scare when a wild turkey ran right in front of my car, but I managed not to hit it. The hike around the lake started at a lovely CCC building that also housed the restrooms. 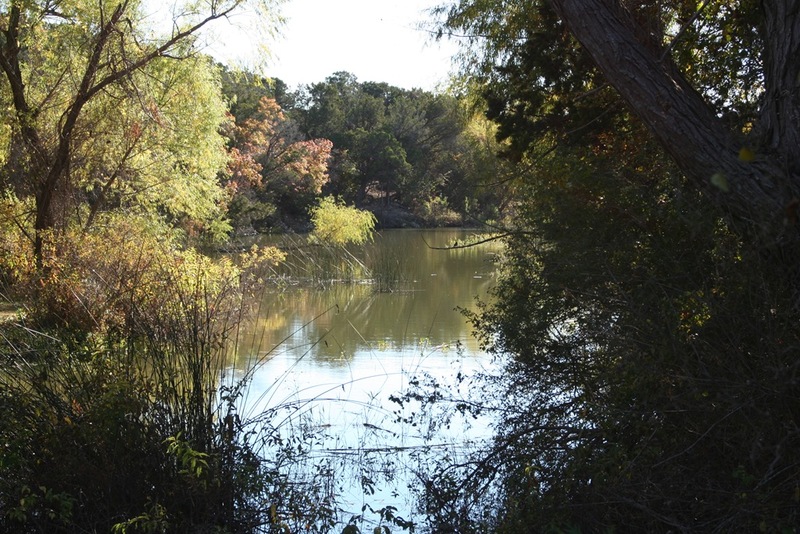 Lake Meridian was formed when they dammed Bee Creek and the path follows it’s way around it. At first the path stuck close to the lakeside. A few turtles sunned themselves on logs and we spotted and armadillo in the underbrush. The path met the park road and we followed that a bit before going through a campsite and back onto the path. There were a couple spots where we were uncertain which way to go, but we figured it out. Towards the end we ended up following the road again, but we made it all the way around the lake. About two miles all together. Especially with the foliage it was a lovely fall hike. I love hikes like that. It looks like a beautiful place. I miss Meridian State Park! We use to go there all the time when I lived in Texas since we lived about 30 miles away. I love that part of Texas so much.